It's the Man of Steel's worst nightmare: an obsessed villain who not only knows all of Superman's secrets but is also willing to kill anyone who has ever stood by him! No one is safe when the one you're hunting has no discernible motive or pattern! 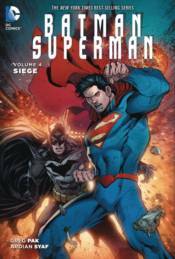 Collects BATMAN/SUPERMAN #16-20, ANNUAL #2 and BATMAN/SUPERMAN: FUTURES END #1.